The weird thing about blogs is how attached one gets to them. There is this vicarious living through the exploits of others that is incredibly satisfying. You know what the person likes, loves actually. You know what they eat and what they are working on, and what you have in common. They teach you new things, and old things, and introduce you to things you might have never heard of. They share your book fetish and encourage you to buy more books. They make you laugh and think and view the world with wonder. And for the confirmed introvert, you never have to meet them. But even thought your paths has never crossed, you know you would be the best of friends, in your mind you are already the best of friends. Then one day, they stop blogging. They have a good excuse. But you feel as though in some way they have died. You miss them. Every week you think, what are they doing now. Sometimes you go back and re-read old blog posts. It is a very sad realization. This is how I felt the day I found out the Matthew Rowley was suspending Rowley's Whiskey Forge. I was so devastated. I lost a friend. Rowley loved pickles and pie. He had a library that rivaled mine and he was always suggesting books to add to it. He loved old drawings, and language and ice cream and he wrote a book about moonshine and waxed poetic about Tiki drinks. Well, Matthew Rowley is alive and well, even though he's not contributing to my weekly fix of fun facts, he has been busy. 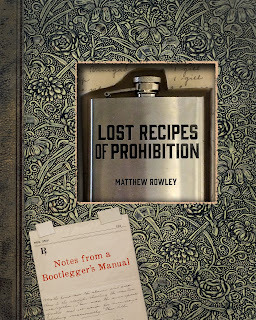 Lost Recipes of Prohibition is one of the reasons he left the forge. Like much of his work, it is a twisted tale of discovery. It seems that friend and fellow collector offered up a book that might just be right up Rowley's alley. It appeared to be a particular bound book on the outside, but the blank pages within offered up detailed notes from a bootlegger's recipe book. It offered up how to concoct this and that in an era when this and that were illegal. 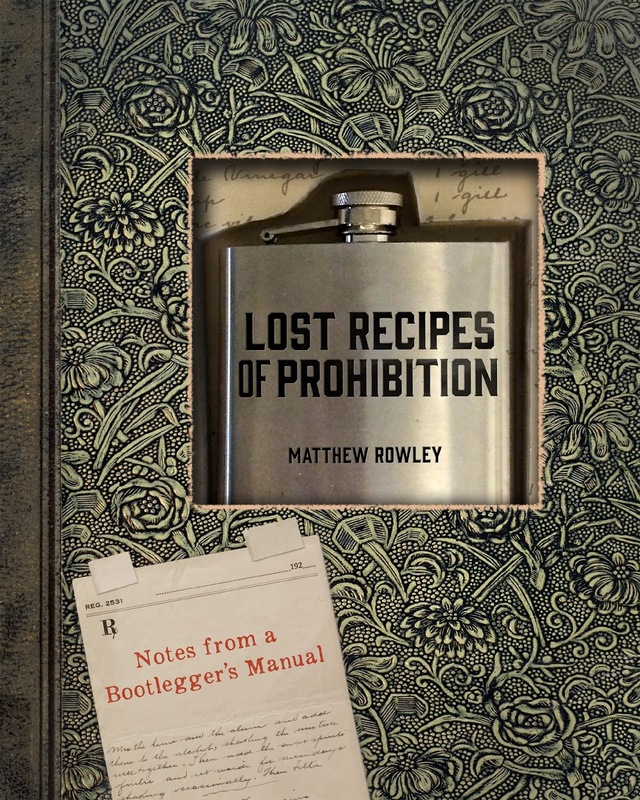 So Rowley set out not only to find out who the author was, he set out to recreate the manual for the modern day bootlegger, or avid reader of Rowley's Whiskey Forge. To start with, the book is handwritten, so deciphering the notes is not an easy task. The author was knowledgeable in several languages, and had a fondness for jotting notes on scraps of paper. Botanicals and bases from the 1920's are not always the same as they are in today's world so recreate some recipes required advanced chemistry. Matthew Rowley takes us along on his journey to hunt and cook and distill with fun and flair. There are all the instructions one needs to set up a chemistry lab, for those of you so inclined, but there are also nifty drinks to make from your own paltry liquor cabinet. Like this one. Shake in a cocktail shaker with ice. Strain into a cocktail glass or coupe. Garnish with a brandied cherry. Cocktail enthusiast, book nerd, mystery lover, this book covers a lot of bases. Add Lost Recipes of Prohibition to your collection. Hey everybody needs another book. Did we mention he was a fencer? A fencer. Of course he was a fencer. Ah Matthew, we hardly knew ye.